This article appeared in the Tribune Chief Reporter regarding the Chinese Bahamas deal. Wednesday Nov 2, 2016 Deputy Prime Minister Philip Brave Davis stressed yesterday that the proposal for a partnership with the Chinese for development of agriculture and fisheries in Andros was not before the government for consideration. But while he later criticized media reports about the proposal, Minister of Agriculture and Fisheries V Alfred Gray yesterday said that such a plan could be a “good thing” for the country because Bahamians generally “lack interest” in the agriculture industry. He also admitted that he told newly appointed Chinese ambassador Paul Gomez that he could discuss the proposal with “interested investors”. Both men were responding to a report in The Nassau Guardian on Tuesday, which stated that the government had given the “green light” to its embassy in Beijing to further pursue such a partnership. Despite the denials from the government, the report prompted Free National Movement (FNM) Leader Dr Hubert Minnis yesterday to criticize Prime Minister Perry Christie for his “deafening” silence on the matter. It is not the first time he has raised concern on this issue. In July, while speaking at a rally at Christie Park, Dr Minnis said the government was negotiating with the Chinese for 10,500 acres of land in Andros. The proposal reportedly projects a $2.1 billion injection into the local economy over ten years through an equal partnership between Bahamians and the People’s Republic of China. According to the report, the proposed partnership will entail the incorporation of 100 companies, with the agricultural products and seafood to be used for local consumption, and exported to China and the United States for sale. The proposal also reportedly includes the option to lease 10,000 acres of Crown land in Andros. He noted that such an initiative would pose a conflict with the efforts of the Bahamas Agriculture and Marine Science Institute (BAMSI). In a statement yesterday, Mr Gray called the report “utterly false”. “The government is not considering the grant of Crown land nor any other matter as set out in the article,” the statement added. However speaking to reporters before the statement was released, Mr Gray said the Bahamas ambassador to China approached his ministry to see if it was okay to enter into discussions about Chinese investments in fisheries, factories and agricultural pursuits. However he stressed that there was no proposal on the government’s table. However Dr Minnis insisted yesterday that the proposal was part of the “secret deal” Mr Christie negotiated with the Chinese to remobilise the Baha Mar resort. Dr Minnis said: “The people have been asking for months what the embattled prime minister is going to give away as part of his secret Baha Mar deal and more and more, as we learn the truth, the harder it is to fathom that the PLP government had the Bahamian people’s best interest at heart as they negotiated this scheme. #“From fishing rights, and thousands of acres of lands being given away, to finding out the buyer is a Chinese company only because they stepped forward revealing that they are in negotiations to buy the resort. 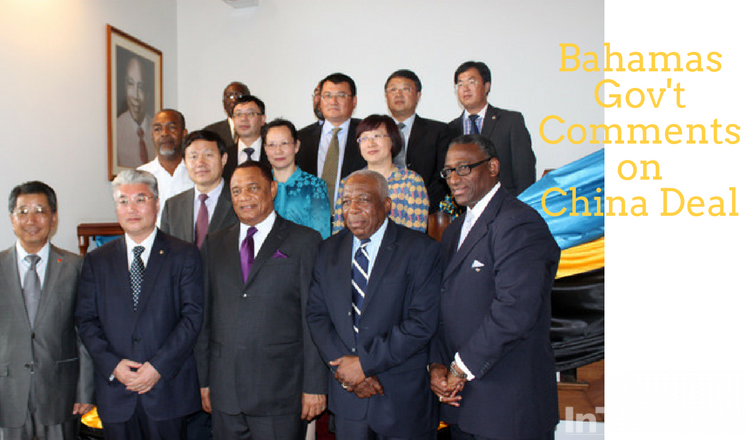 “The Chinese will be able to use the fish and agriculture produced on Crown land to make the Pointe and Baha Mar self sufficient and not reliant on other Bahamian goods. This will not help our suffering economy but rather hurt it even more,” he said. FNM Long Island MP Loretta Butler-Turner also weighed in on the issue yesterday. In a statement, she said the “relevant facts on a proposal of this magnitude need to be assessed in a rational and deliberate manner”. “The full proposal should be released and made available for review and debate by the general public and the House of Assembly. Again, it is essential that the scale and details of this large-scale proposal be fully disclosed,” she said.